We all associate exercise with weight loss or building muscles, but the mental benefits may far outweigh the physical. In our high-stress society, regular exercise can help us not only de-stress but it can make us feel happy and confident within ourselves and one of the main goals at Surge Body Fitness is to help both men and women feel confident and content in their bodies. Surge Body Fitness offers an experience like no other, the energizing space is a balance of both mindfulness and purpose and each class is taught by their incredible team of professionals with true encouragement and inspiration. 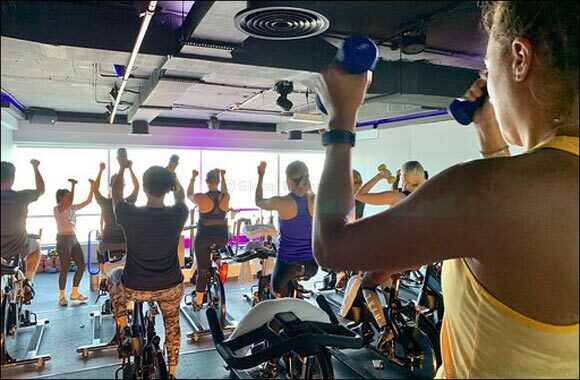 The newly launched combination classes, which consist of a Ryde session and off-the-bike exercises, and the traditional Ryde classes that teach and rewards good form and proper pedal stroke along with balancing and full-body coordination offering a dynamic experience making one more confident in their own skin offering a sense of accomplishment. With great music pumping and the group spinning as one, your instructor takes you on a journey of hill climbs, sprints and flat riding. You can control your own resistance levels and speed so you can build up your fitness level over time along with your sense of personal achievement. Regardless of your fitness level, spinning unifies groups of people through hard work and dedication. You don’t just sit in class unmotivated, you and your neighbour begin to motivate one another – we are all in it together on this journey of self-love together. With vast changing facilities, generously stocked with luxury grooming and skincare essentials and easy online payments through the Mindbody booking app, Surge Body Fitness classes can easily fit into your everyday routine. Sign up today and get your first session free.